Hello all, since the recent news of the Canadian sniper setting 2.2 miles record shot with his .50 BMG McMillan, I thought I would post some info on the previous record holding caliber, the .338 Lapua Magnum. 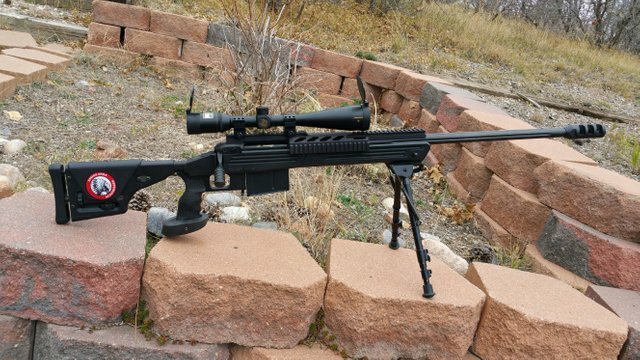 The Savage 110BA chambered in .338 Lapua magnum is a dream to shoot. After years of being on my wish list, I finally broke down and bought one a while back. Best purchase I've ever made. This is absolutely my favorite weapon to shoot. Unlike the .50 Calibers, this one does not beat you to death either with recoil, or with concussion. You could shoot hundreds of rounds through it at a time, and still want to shoot more (if your budget allows!). Contrast this with the .50 BMG where even the military has to limit the amount of rounds a soldier can shoot in one day to just over a handful (according to a close friend with son fresh out of sniper school). The Savage has an excellent muzzle brake/flash hider that reduces recoil to less than the typical shotgun. It has a unique, pleasant higher pitched crack when firing that is different from .308, 7mm Magnum or shotgun blasts. Factory rounds are expensive, about $5 per round. Handloaders can expect to cut that in half (save your brass!). I found that my rifle liked my handloads better than the factory Ammo, even though I generally like Hornady, and it also performs well. Here are the first 5 rounds out of my rifle after boresighting. 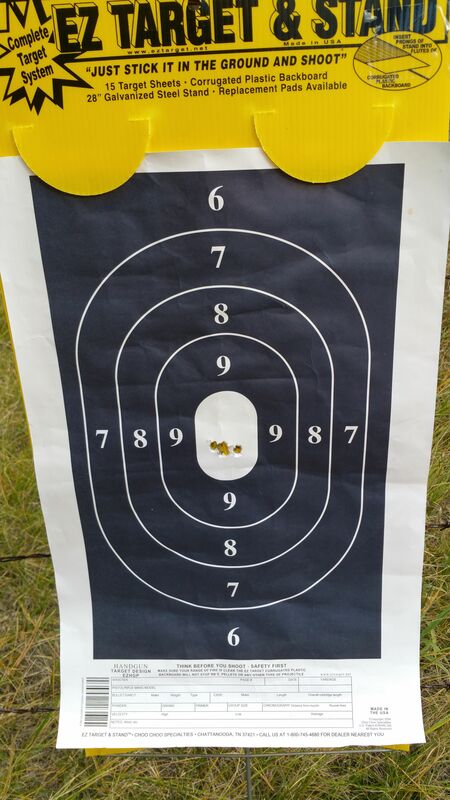 At 75 yards, I was surprised to have it on paper, let alone in the bullseye. I was even more impressed when the next four all just got tighter together as I made minor sight adjustments to put it closer to middle. 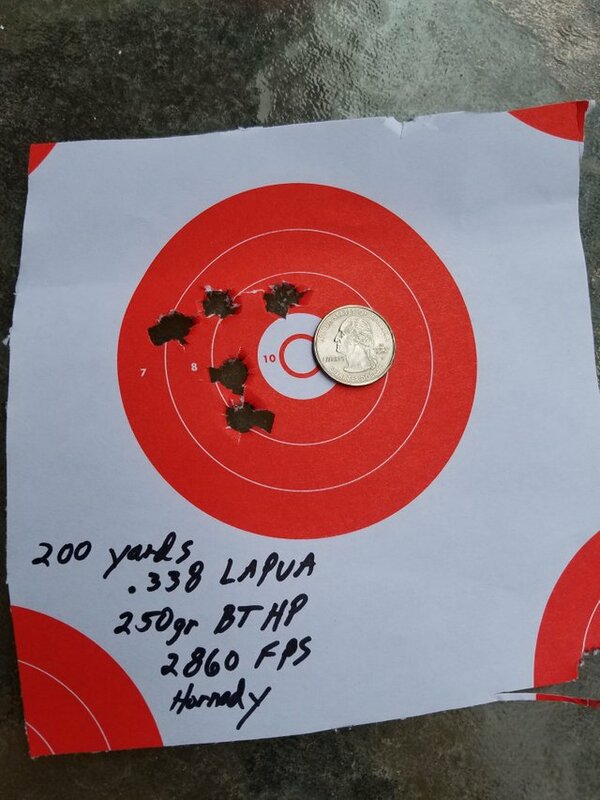 After sighting in a little high at 100 yards, I then proceeded to adjust for a 200 yard zero with these results below using factory Hornady 250gr. BTHP ammo ~2860 fps - 5 shots about the size of a quarter from two football fields away. Still getting used to the rifle at this point, I'm sure it could do better. I always prefer to tune my long distance rifles with handloads for cost savings and consistency. I changed my handloads to use 180 gr. Accubond bullets, with Vihtavuori powder speeding up to around 3500 fps. Some folks like heavier bullets to reduce wind drift, but I prefer the flatter shooting of the lighter bullets. This load only drops about 22" at 400 yards, compared to over 42" for the factory 250 grain loads. A big difference when hunting and estimating range on the fly. 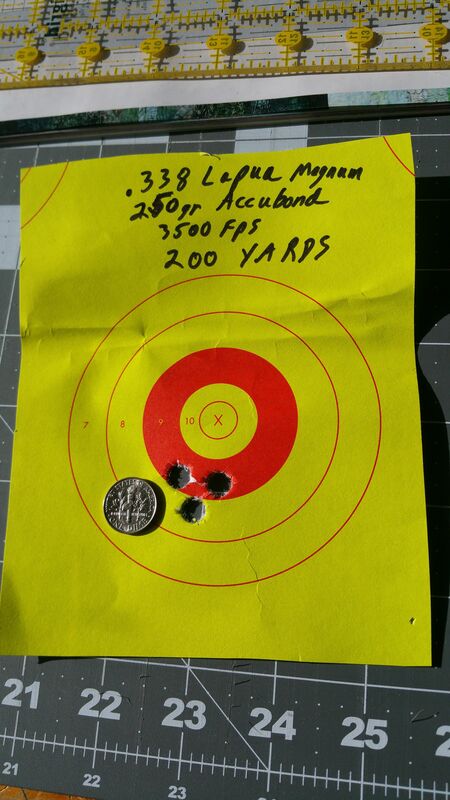 This last group below was the improved group using my handloads, 3 shots in the size of a dime at 200 yards. Not yet as good as "The Canadian", but I can't wait to start pushing distance at the range to see how well this rifle (or more likely my error) can do at 1,000 yards. Any other South Denver Colorado shooters out there? Upvote and send your targets! Look at that pattern!! Very nice. Looks like you're doing pretty awesome here on Steemit. I had a great instructor to get me started! Thanks for that intro! I'll have more questions, don't worry! I can't wait to get some of your training classes and documents downloaded from your new site! Nice shooting Vasily Grigoryevich Zaytsev! Thanks! Next time out is 400 yards, then 600, and our range is supposed to expand to 1,000 yards later this year. Whoop! Thanks! I don't do much hunting anymore, just coyotes and prairie dogs. So much work to haul the deer back and process! Just wasn't much of a shooting challenge anymore like for you... I found it more challenging with smaller targets, try making a prairie dog headshot at 100-200 yards, now there's some fun! Reminds me of the time my brother and I were fishing in a boat. We had our bows, and I challenged him to hit a squirrel in a tree about 30 yards away. He got it, but stuck both squirrel and the arrow to the tree about 20 feet high! No retrieving either one, but the memories were priceless! Thanks! I can't wait to get back out and go farther! Thank you for sharing information, the more you start getting a lot of knowledge for me, good work continue his work :), I follow you please follow me, too.